The Miss Kiss eyelash range are all made by hand, homemade by the creator, Michelle. They are produced using 100% mink hair, meaning they are lightweight and super soft, but they are not friendly for vegans and those against using animal products. Nevertheless, mink eyelashes tend to be of high quality and can last quite a while. Beautifully long, wispy lashes that are great for a dramatic night out look. The criss-cross style makes them appear natural and fluttery, but still dark and impactful. Wispy, thin lashes that are ideal for a day to night look. The tapered hairs are slightly crisscrossed for a natural look. These are thinner and less dense than the 5D-10 lashes, but still beautiful and flirty. There is a vast number of lash styles sold by Miss Kiss, so it’s a matter of finding what works for you. Each style is made from Siberian mink fur and is hand-stitched into a beautiful lash. They can be reused for around 15 times, or even more if you care for them well. The products come in different packaging, making for a unique surprise every time you order. They are all super cute packaging options, though, so keep an eye out! Luckily, Miss Kiss offers international shipping, so you can get your hands on these lashes from anywhere. But where can you buy them? Miss Kiss eyelashes are sold exclusively on Amazon, making them very accessible for their consumers. It would be nice if they had their own official website, but they at least do have a Facebook and Instagram presence, and you can see the different lash styles on these social media pages. Miss Kiss eyelashes cost $9.99, which is exceptionally good for handmade, mink fur eyelashes. Just looking at these falsies, you can see fair quality, and yet they are cheaper than many high-end brands. Customers review them very positively, too, which means you are getting value for money. As with everything in life, there are some downsides of the Miss Kiss company and their lashes. This brand still does not hold a strong internet presence, aside from their Instagram followers and a Facebook site. With that being said, it is difficult to find their products on the internet, except Amazon does offer some selections and it is maybe possible to place an order directly through a DM in Facebook messenger. Aside from Amazon, it is not clear how or where to buy the Miss Kiss selections of your choosing and this might prove to be frustrating for some customers. Additionally, the brand’s system of sale is a bit confusing too. They obviously offer retail purchases, but it is not completely clear if they also sell wholesale and sell for dropshipping purposes. Some more clarity and an official website could work wonders for this company. Miss Kiss is a retail false eyelash provider, and also one that offers wholesale prices and custom packaging for those who intend to distribute their own eyelashes to customers. The company has somewhat of an online presence, but we really wish they had an official site where it would be easily possible to find all of their services in one convenient place. For this reason, we awarded them an average company reputability score, because they definitely will fulfill orders in a timely manner, but their business model is not completely clear and accessible to all individuals. With retail lash prices around $10.00 USD, and wholesale pricing likely much cheaper, we awarded Miss Kiss Lashes a decent score for their price, because overall you’re getting a decent deal when you buy their falsies. For the price especially, the quality of Miss Kiss Lashes is excellent. All of their designs are made from 100% real Siberian mink fur, so their eyelashes are ultra lightweight and wearable, adding to the wearer’s overall comfort level. Miss Kiss does lack some variety, at least from what can be seen online. Either they should update their product lists, or simply make them for visible to the public. 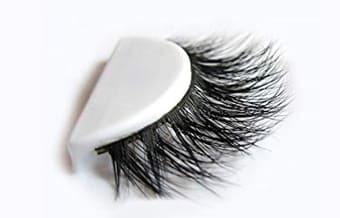 With the right care, these eyelashes can be worn about 15-20 times, which is decent, hence the higher durability rating. Miss Kiss is an affordable, up and coming brand that sells high-quality mink lashes. The only negatives are that they are little-known, have very few reviews, and lack an official website. However, since they are such a small brand, this could be set to change in the future as they gain traction. Generally, the prices are great and the quality is good, so we hope that more people come to recognize Miss Kiss eyelashes as a good brand in the future. As more consumers decide to give them a shot, they will be able to expand in size and maybe even develop a website!